Srila Prabhupada has made many statements to the effect that if he is to be given any credit for his activities, it is all due to his spiritual master, Srila Bhaktisiddhanta Sarasvati Thakura. Just as Srila Prabhupada founded the Krishna consciousness movement to execute the order of Śrī Caitanya Mahāprabhu and His Divine Grace Śrīla Bhaktisiddhānta Sarasvatī Ṭhakura, members of the Krishna consciousness movement are meant not only to execute the same order but especially the order of His Divine Grace Srila A.C. Bhaktivedanta Swami Prabhupada. This is what it means to be a successor in the disciplic succession: to simply execute the order of the spiritual master, cent per cent. Interviewer: What happens when that inevitable time comes when a successor is needed? Disciple: He is asking about the future, who will guide the movement in the future. Prabhupāda: They will guide. I am training them. Interviewer: Will there be one spiritual leader, though? Prabhupāda: No, I am training GBC, eighteen all over the world. Disciple: To see that the original teachings that Prabhupāda has given are not in any way changed. The Governing Body Commissioners are managers who are meant to always be initiated disciples of Srila Prabhupada. This system is never to be changed. Now does that mean it should be changed when Srila Prabhupada is no longer physically present? How are directors expected to be replaced with initiated disciples of Srila Prabhupada if Srila Prabhupada stopped initiating after his disappearance? This question is flawed. Srila Prabhupada did not stop initiating; He ordered for initiations to continue to be done on his behalf (see July 9th letter), with newly initiated devotees becoming his disciples. The duty of the GBC and every other disciple of Srila Prabhupada for that matter is “to see that the original teachings that Prabhupāda has given are not in any way changed”, as the disciple put it. This is what it means to be a successor. Srila Prabhupada’s success is in his teachings – his books. To preserve and continue to spread these teachings without change is to act in the capacity of a successor in the authorized disciplic succession. To change these teachings would put one outside of the disciplic succession. So to be a spiritual master or successor in Srila Prabhupada’s institution – in Lord Chaitanya’s sankirtan movement – does not necessitate one to be at the topmost platform of devotional service, or an uttama-adhikari, because actually Srila Prabhupada did not intend for his successors to function in the exact capacity as an uttama-ahikari spiritual master, initiating disciples left and right but to simply repeat what he has spoken in his books and lectures, distribute his books, etc. This is how one acts as a spiritual master and successor in the disciplic succession today. 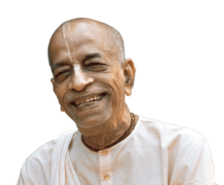 The topmost qualification aspect, the accepting of disciples — this is left to Srila Prabhupada, who has so mercifully extended his mercy in that way for the entire world to take advantage of – for those who are furtunate.